1. 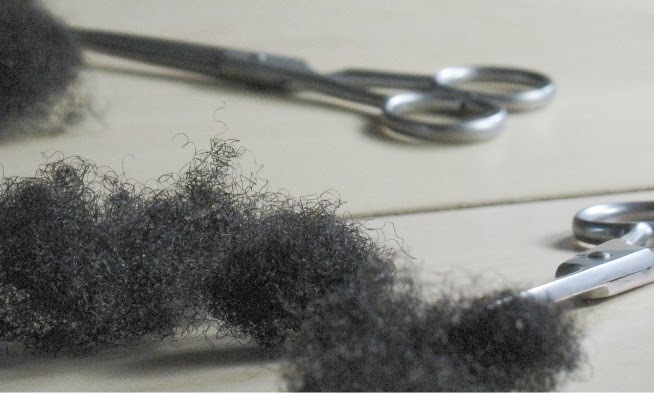 Does SLS break hair? 3. Is SLS an irritant. 1. Have you noticed that oil and water do not mix? Oil will always float to the top of water. Even if you really mix the two, droplets will form but allow it to settle for a few hours and the oil and water will naturally separate. See the diagram below. 2. However have you noticed that when you wash oily dishes with soap, the oil is lifted off? Water loving part - usually refered to as a polar head - you know polar like the ice caps made up of water. Oil loving part - usually referred to as a tail ( or a lipid tail - lipid means oil). See the diagram below! 3. 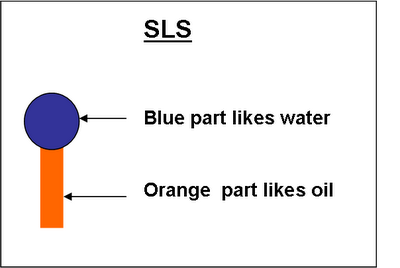 So what is so special about surfactants like SLS? Surfactants like sodium lauryl sulphate (SLS) can interact with both oils and water. This is really special because it means a chemist can therefore combine oil and water WITHOUT the oil separating from the water. 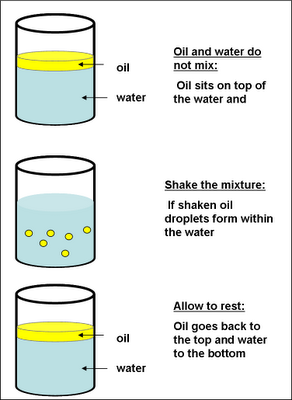 This means the oil can be dissolved in water. This happens because the surfactant helps create micelles. 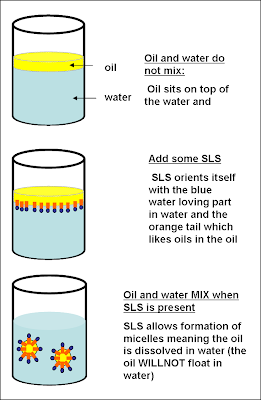 The diagram below shows you how the SLS arranges itself in a water and oil mixture. It also shows how micelles can be formed. 4. So what is a micelle? 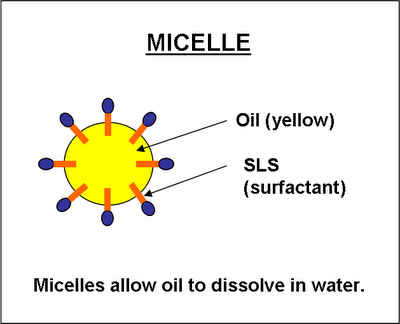 In the simplest system, there are three parts needed make a micelle - oil, water and a surfactant - see the diagram below. Next up - Part 2 of 2 - Is there evidence to support the theory that SLS Shampoo breaks hair? Wow! I didn't think you were going to get to answer my question so fast! Thank you this is gonna be great! Bravo, on that simple explanation!!!! Adorei ter conhecido seu site!Parabéns!Tem muitas dicas bem valiosas.